For the last week Baltimore has been all a buzz about the big snowstorm. We woke up yesterday to a little snow with more steadily coming down. The girls were of course beyond excited. The Bee, you may remember, has been not-so-patiently waiting to go sledding all winter. By mid-morning our snow had turned to cold rain and washed away the little snow that had accumulated. It was pretty sad. 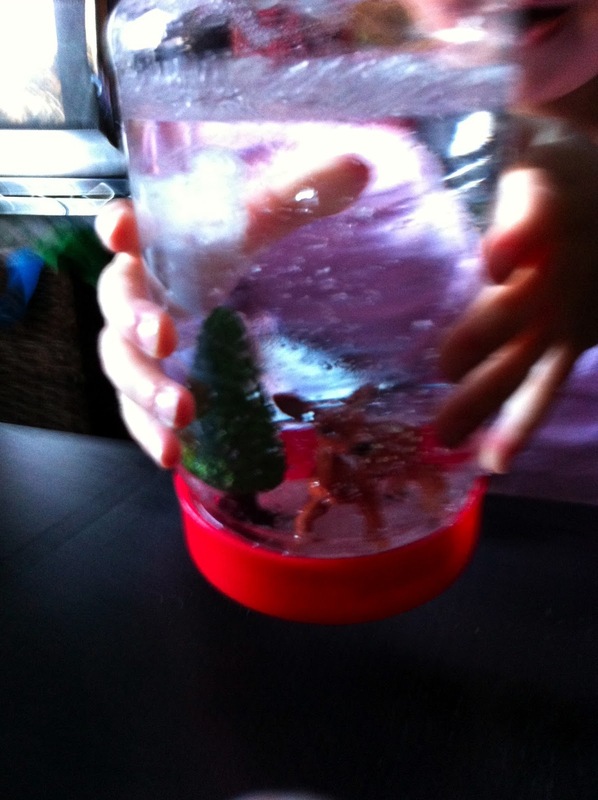 So to help ease the pain, we made our own snow globes. This way we can make it snow anytime we want. 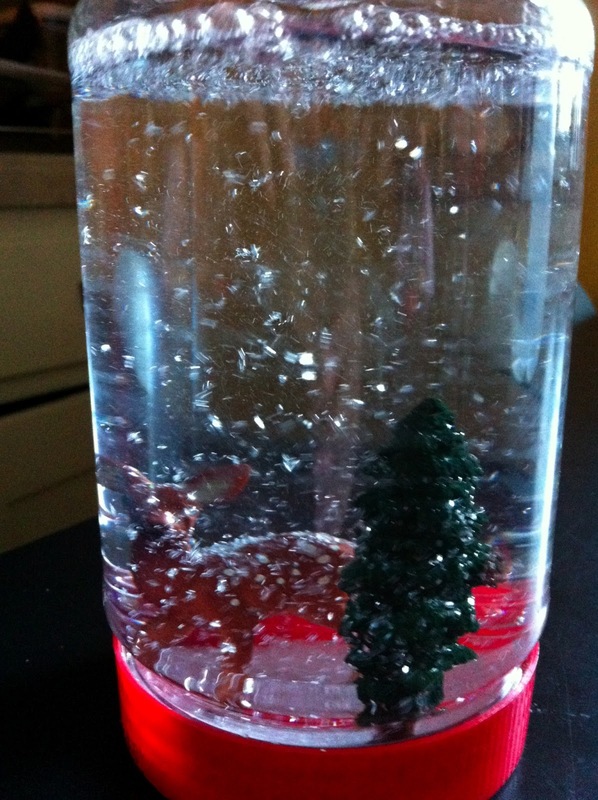 The snow globes were actually pretty easy to make. I had been saving these two empty peanut butter jars for a while just for this project, but you really could use any jar with a tight fitting lid. We then found some small plastic figures at the craft store, we picked a tree and deer. The Bee and I glued the figures to the inside of the lid with a heavy duty glue and left them to dry for while. When the Bean woke up I filled both jars most of the way with distilled water. You can make your own distilled water but I bought a jug for .89 cents at Target just to save time. 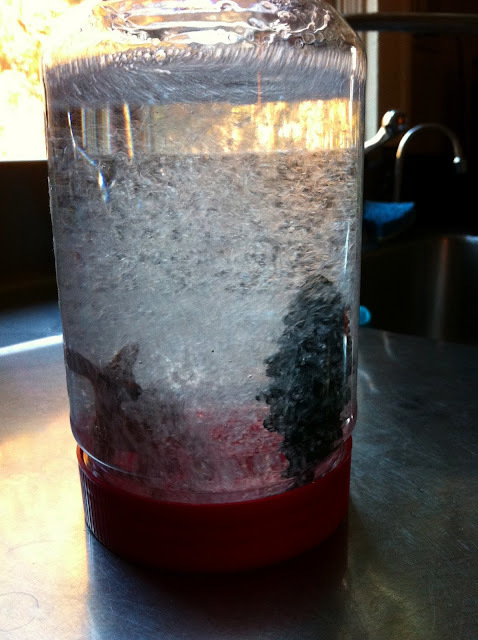 We then added a 1/2 teaspoon of liquid glycerin (you can also find this at the craft store) and some fine white glitter. The glycerin helps to slow the glitter down a little as it falls I think. I then tightly screwed on the lid and let the girls shake. After a while one of them started to leak a little so I might suggest hot gluing the lid shut to prevent this from happening. The other seems fine so it might have also just been the way I put the lid on. Either way the girls were very excited to have made the snow globes and loved watching the snow come down whenever they wanted. 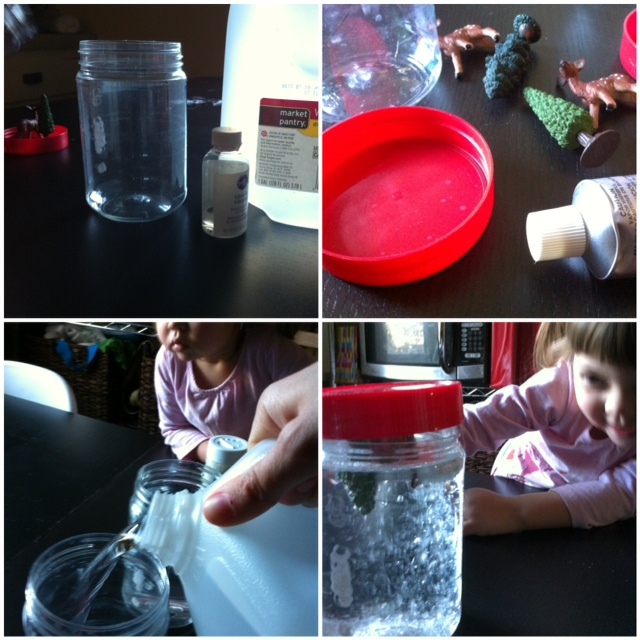 Love it, making snowflakes (water and borax) today, but have a nearly empty peanut butter jar I've got my eye on. Thanks for this.